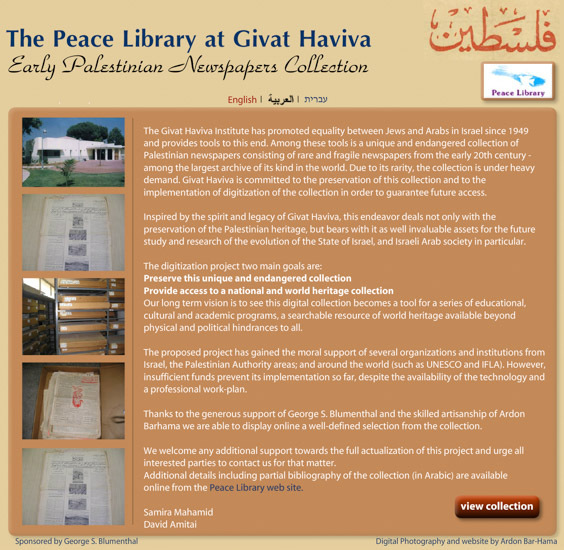 A unique collection of Palestinian newspapers from the early twentieth century was endangered due to the fragility of the paper and the rarity of the newspapers. In order to preserve these important witnesses to Palestinian and Israeli history, a selection of these newspapers has been digitized with the support of George Blumenthal and the skilled artistry of Ardon Bar-Hama. This world heritage collection is now available online in high resolution and can be utilized for educational, cultural and academic programs.